The Draft Transit Master Plan is now posted on this website. You can submit your comments now until April 30, 2018. 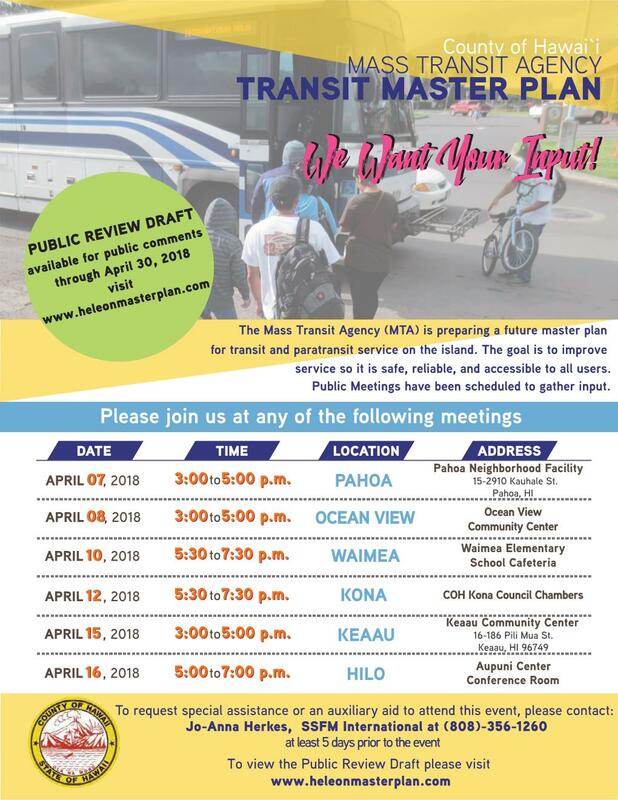 The Mass Transit Agency (MTA) is developing the County of Hawai‘i's next generation Transit Master Plan (TMP). The comprehensive TMP will provide a 20-year look ahead to the transit system needed to meet Hawai‘i County's needs through 2040. The overarching objective of the TMP is to identify what needs to be done to develop a high quality transit system that is safe, reliable, friendly, and accessible for all users. The Transit Master Plan is the first for Hawai‘i County in twenty-five years. The TMP will identify key corridors linking rural communities and will establish performance standards for transit service. The TMP looks at bus service, creation of hubs, station and stop design, as well as multi-modal needs for bicycles, taxis and pedestrians. The TMP creates a year by year capital and operating financial plan. The TMP will integrate strategies for creating a transportation network which is designed and operated to enable safe access for all users in Hawai'i County.